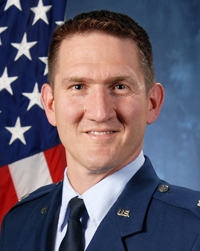 Engineering honor society Tau Beta Pi has named ASME member Lt. Col. Donald W. Rhymer, MSME '99 and PhDME '05, as its eighth McDonald Mentor. The award celebrates excellence in mentoring and advising among Tau Beta Pi educators and engineers who consistently support the personal and professional development of their students and colleagues. Dr. Rhymer is professor and department head of engineering mechanics at the United States Air Force Academy (USAFA) in Colorado. He is the 2013 Tau Beta Pi-McDonald Mentor, and will be honored Nov. 1 at the association's 108th annual convention in Ames, Iowa. Established in 2005, the McDonald Mentor Award recognizes engineering educators or professionals in industry, government, or service organizations who have shown true concern for the individual, supporting an environment for developing talents, and who have earned respect and recognition for their contributions to their field and to the greater community. A devoted advisor, Dr. Rhymer was selected by Tau Beta Pi for going beyond the call in developing and mentoring engineering students. Rhymer received his B.S. in engineering mechanics from the USAFA and a Ph.D. in mechanical engineering from the Georgia Institute of Technology. He has been an instructor in the engineering mechanics department at USAFA for more than six years. In 2010, he became the deputy for the mechanical engineering curriculum. Rhymer advised 24 cadets during the recent academic year, including a Rhodes Scholar. In addition, he leads a council of cadets majoring in mechanical engineering to foster a direct means of student assessment and feedback. His devotion to his profession was recently recognized when the USAFA named him Outstanding Academy Educator and Department of Engineering Mechanics Instructor of the Year for the department of engineering Mechanics. This year, the Colorado Zeta Chapter of Tau Beta Pi also selected him as Instructor of the Year.